Today I'll be writing about some interesting SQL injection vulnerabilities I recently found. This is a private program so I won't be mentioning who the vendor is. So I looked at the request and set the value of the parameter to `23' and '1'='1` and as expected the endpoint returned valid results which means it's vulnerable to SQL injection! That's it, a lovely basic Boolean-Based SQL injection let's write the report and get a nice bounty! The PoC worked, I reported the vulnerability and received the bounty. I didn't stop right there, now knowing how the WAF works, I kept testing all other endpoints and found a couple more with the same technique. Ok, that probably was not that hard, let's move on to the next level. One of the endpoints (a non-json one) was also vulnerable to boolean based sql injection similar to the one above, but the WAF this time was acting differently. When my SQL query evaluated to `true` the response had a specific word, let's say `2222`, but when it evaluated to false, the application returned a static error page. The problem was that the WAF was returning the exact same response as when the query evaluated to false which means I can't differentiate between a response that was sent by the WAF and a response that was sent by the server when the query is evaluated to false as they both are exactly the same! I kept trying to bypass the WAF but no luck, it was returning the same error page for random requests even when the query evaluated to true so I wasn't able to extract anything from the database. I was about to give up when I came across an idea to write a python script that repeats any request that returns an error page (which means the query was evaluated to false) for 5 times to make sure we get response from the server not the WAF since the WAF was blocking random requests and it actually WORKED! Again, bug hunted, silly WAF beaten, report sent and bounty granted! I wanted to write about another interesting SQL injection on the same program but since it's a little bit different and has nothing to do with the WAF, I will keep it for the next post. The Story: In October 2018, Shopify organized the HackerOne event "H1-514" to which some specific researchers were invited and I was one of them. Some of the Shopify apps that were in scope included an application called "Return Magic" that would automate the whole return process when a customer wants to return a product that they already purchased through a Shopify store. 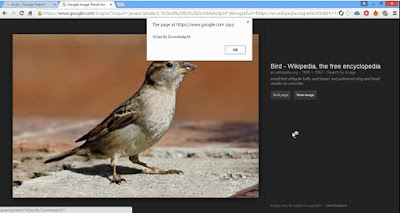 Seven days ago I reported to Google Security a XSS vulnerability I discovered in Google image search. It's not very hard to find , but it's tricky to exploit! I was looking for an image to set as my profile picture on HackerOne , I found the image I was looking for , opened it in a new tab and something in the url attracted me. The url was " http://www.google.com.eg/imgres?imgurl=https://lh3.googleusercontent.com/-jb45vwjUS6Q/Um0zjoyU8oI/AAAAAAAAACw/qKwGgi6q07s/w426-h425/Skipper-LIKE-A-BOSS-XD-fans-of-pom-29858033-795-634.png&imgrefurl=https://plus.google.com/103620070950422848649&h=425&w=426&tbnid=ForZveNKPzwSQM:&docid=OEafHRc2DBa9eM&itg=1&ei=9ID8VZufMYqwUfSBhKgL&tbm=isch "
the value of the parameter "imgurl" is set to the href attribute of an <a> tag with the text "View image".